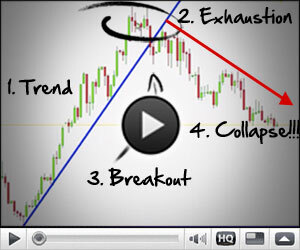 An indicator based on the work of famous trading author Daryl Guppy. 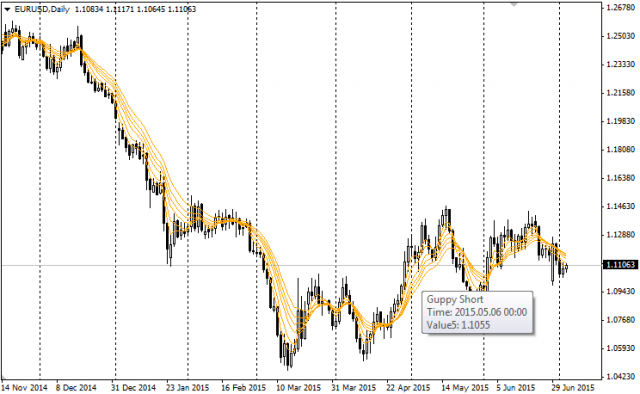 It is composed by 6 EMAs of 3, 5, 8, 10, 12 and 15 periods which give you the direction and the strength of the short-term trend, the speculator trend. 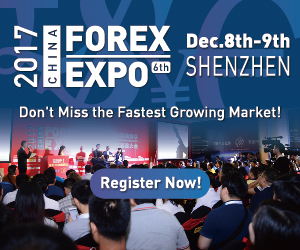 It is used in combination with other group of six EMAs which measures the direction and the strength of the long-term trend or the big-investor trend. This group of EMAs are of 30, 35, 40, 45, 50, 60 periods like Daryl Guppy say for daily timeframe. This indicator was made to analyze and trade on daily timeframe charts but can be used in other timeframes, like M15 or H1, with the same periods and setups. I made these indicators so you can change the type of Moving Average, the period and applied price, i.e: high, low, open, close, typical and weighted price of the bars used to calculate the moving averages. You can change it on your own to trade in other timeframe that you feel more comfortable or to make the indicator more sensitive to little changes of the current trend. Both group of EMAs can be used to measure the agreement or disagreement of these two types of traders: investors and speculator. This gives you a better understanding of this fight between them and the possibility of better entries in favor of the current trend or imminent changes on it. I must say that when the two groups of EMAs are parallel and close together, both among themselves and between groups, investors and speculators are largely in agreement and a big move is very close. As I have read in “Market Wizards”, it is like when in the past in a very crowded Wall Street the room was seized by silence with motionless prices, and a little time after, a wild move on them made people turn euphoric. I have to say that I am not a programmer and I only made this indicator for myself, and now I want to share it. In this second version, I have added the possibility of shifting the moving averages like file45 recommended me. Guppy (Long and Short) is a Metatrader 4 (MT4) indicator and the essence of the forex indicator is to transform the accumulated history data. Guppy (Long and Short) provides for an opportunity to detect various peculiarities and patterns in price dynamics which are invisible to the naked eye. How to install Guppy (Long and Short).mq4? 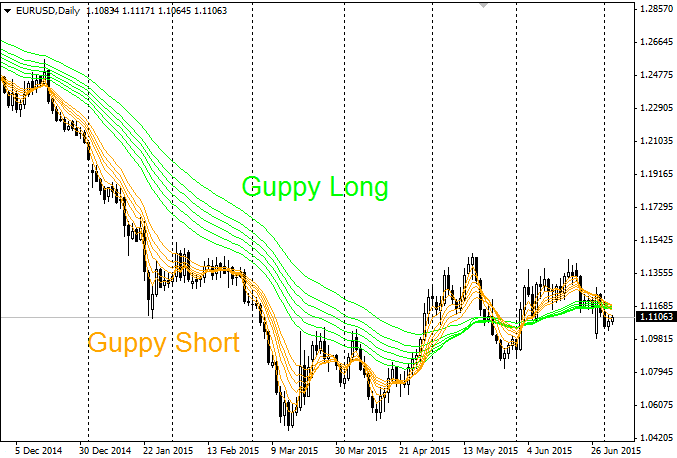 How to remove Guppy (Long and Short).mq4 from your Metatrader 4 Chart?